Discus Music us delighted to make this distinguished improvising duo available ona disc recorded and produced by Shaun Blezard with artwork by Silena Lena. It begins as do so many albums of so-called improvised music, slamming into gear at high-speed, both musicians blazing trails around each other at a pace far outstripping the ear's ability to follow, let alone the mind's to comprehend. Yet, that space is not the one saxophonist Trevor Watts and pianist Stephen Grew inhabit for long; the depths they plumb and the diversity with which they achieve maximum effect comprise just two of the ingredients making this trip through the improviser's orbit such a pleasant and exciting one. Unpredictability is the session's watchword, a blessing for the poor writer far too often subjected to high-energy and low-contrast aimlessness foisted on listeners in the name of freedom. About halfway through "Shepherd's Return," there is a sudden decrease in activity as the back-and-forth conversational style of what might be called British improv is highlighted, slows and stops. Suddenly, the preparations in Grew's piano become more apparent, and equally suddenly, Watt's masterful responses to the four-note figures Grew repeats stand out in stark relief. Watts slides into a stunning display of syncopation, motivic development and phrase delivery that could be an encyclopedia entry for younger improvisers to study. The two begin to toy with scale, blending and contrasting harmony as leaves sprout from a tree and with equal malleability. 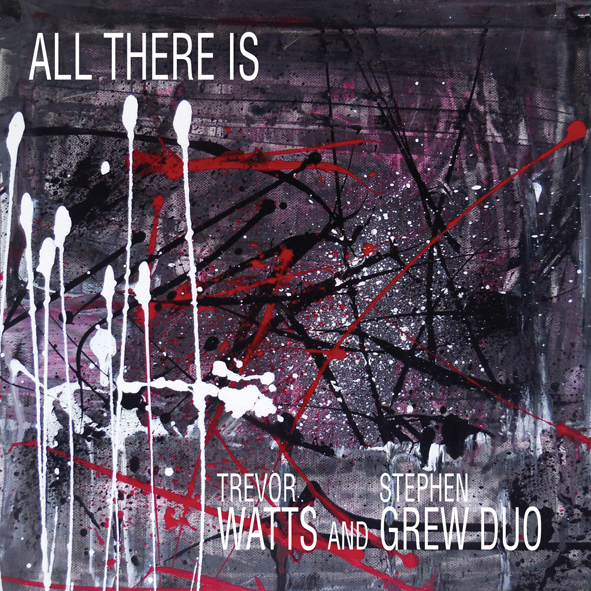 This duet session by Trevor Watts and Stephen Grew has one of the best recorded sounds I’ve heard in ages; it captures the top, middle and bottom of this music with a precise clarity. Shaun Blezard was at the desk, Lancaster Baptist Church the location..... the sound quality is a stone built sonic, without wave or reverb. This is really listening to music, not the room. If this is All There Is then it is enough, because it is wonderfully generous on lots of levels. But first I digress: Trevor Watts – his name is forever linked to John Stevens and the groundbreaking free improvisation work of the Spontaneous Music Ensemble (SME) and the subsequent electric ensemble, Amalgam. At the time I took in as much I possibly could of that huge body of music, live and on record, yet as important as those projects were, (and they were crucial to the UK scene), for me Trevor Watts is always associated with someone else; the Ghanaian multi-instrumentalist, Nana Tsiboe. They began playing together at the tail end of the 1970's and were still linked up at end of the 1990's. Their one ECM album, A Wider Embrace, featuring the Moiré Music Drum Orchestra, was for a significant period, the only record in town in our house. Crucially the content of that album was in the title, the width of their embrace was serious pan-African, with lyrical composition and improvisation hand in glove. In 2002 Trevor Watts returned to free-improv recording 6 Dialogues with pianist Veryan Weston. It is that recording which may well have sowed the seed for what Watts and Grew are playing on All There Is. The new album from January 2017, could be thought of as ‘a closer embrace’ and the gloves are off. This is the redoubtable Trevor Watts in all his manifold compliance to his two main reeds, alto and soprano, played in the context of ‘free improvisation’. If we needed any reminding just what an extraordinary player Watts is, witness the first three minutes of the opening, Shepherd’s Return, as he hangs the straight horn on Stephen Grew’s hands and then shapes a masterclass recital out of the silence of that Baptist chapel; it is truly mesmerising. As for Stephen Grew, he’s a pianist who has brought about his own return to the public arena with telling effect. Back in May, I caught him last on the fine Discus session, Felicity's Ultimatum. The ‘closer embrace’ of All There Is favours Mr Grew’s freeform perspectives. The one to one encounter enables him to literally freely form-a-form out of the presenting situation. The piano folds rhythm into multiples, gallops arpeggios, signals exits and entrances, hammers highlights into clusters, yet.... his ear is on Watts’ case the entire time. The two men refer to themselves as a duo, and be of no doubt, this is indeed duet-music. Trevor Watts and Stephen Grew aren’t against each other, this is collaborative creativity. Take the title track; it sits half way through this session; almost double the length of the other six pieces. All There Is feels so potent yet is utterly devoid of histrionics. Moving through parallel lines, call and response and into short single breaks, the two men propose possible ways forward to each other, signal a simile without making it obvious (to the point I realise I am making that assumption). There seems to be a dual generosity between them, enabling each musician to progress their response to the other, modified maybe, but giving permission to implode a moment where necessary, or escalate a fragment into a longer form. Either way, Watts waits for Grew, to fill a space, to land a point of view; then catches that response and in an instance re-fashions it. Similarly, Grew will lay down a thread of harmonies which can be picked apart by either instrument. Sometimes there’s a crack of concentrated sparseness, for example around 14.28, when the saxophone just lightly but tightly holds a note over the piano as if it were a transparent covering of comfort. I guess that’s it, a sense of humanity about this encounter which exudes positivity. A track that illustrates the fine balance in this partnership is Tunnels. I’ve no idea what the significance of any of the titles are to these performances. I have found myself listening specifically to Tunnels over and over again. In the final four/five minutes piano and alto ride through taut and fast. They cross over each other as if in an enclosed space from which they are forced to burrow out of at speed. Whether I get this impression because the title suggests this idea to me, or it’s a mind-game of my own making, I don’t know. I can’t second guess Watts and Grew. What I do know is, Tunnels is a condensed compression of the agility and skill of these two great players. What is also clear is that here in this tight space, form can be fashioned from a fragment; a hunch, a suggested riff not necessarily designed for the purpose yet becoming a hobbled hitch into an extended encounter. And the underground ‘tunnelling’ produces a music which is very ‘full’, maybe another reason why this session is ‘a closer embrace’. Alto and soprano saxophonist Trevor Watts (1939) is one of the founders of the British improvisation scene (see his contribution to Spontaneous Music Ensemble since 1965 or London Jazz Composers' Orchestra 1970, but also his own Amalgam since 1967 or Moiré Music). So we remember it in Prague - as one of the innovatory icons, each performance of which confirms the versatility of the scene. Stephen Grew Pianist Stephen Grew (here on the Kawai mini grand piano) belongs to a much younger generation (he was drowning his age, but Wikipedia discovered that he was born "around" in 1970), but he did play not only in the Grutronic ensemble but also in his own formations, With Tony Biance, Howard Riley and others. The performance of the couple took place in January 2017 in Lancaster's Baptist Church and is divided into seven peripetios, pretending to break into a jump, speculated by a profoundly encrypted screaming, where the protruding piano undercuts sax, holed-up or disheveled. Everything is here in a constant two-pole motion, though non-inverse, but mutually provocative. As the title of this two-generation "match," All There Is , everything is here, from dynamic prowessing with dramatic accentuation to fuzzy contouring. Both players are always ready to shoot, scratch or rumble, they get up to wild rage, from which the sax is screaming into a banging loop, they break into the tunnels, they get bored, they play wildly, they hunt without Trap networks. The charming breeze of the piano, occasionally pervasive, sometimes heated with jagged strings, excites the trampoline interaction with the splitting, beating or thrusting sax, while Watts produces changes in expression as well as how instruments change.